—Barry D. Yelton, Senior Vice President and Region Manager, Federal National Payables, Inc.
—Peter Pflasterer, entrepreneur and founder, JPS Communications, Inc.
PART I The Financing Process. Chapter 2 Planning and Alignment (Begin with the End in Mind). An Overview of the Planning Process. Chapter 3 Acquisitions, Recapitalizations, and Exits. Selling the Company, Creating Shareholder Liquidity. Chapter 4 Capital Structure and Financing Strategy. Chapter 5 Sources of Capital and What to Expect. Individual Investors (Private Placements Not from Angels or Institutions). Strategic or Industry Investors—Corporate Venture Capital. Community Development Initiatives and Government Agencies. Chapter 6 Equity and Debt Financings: Documentation and Regulatory Sources of Capital and What to Expect. Basic Deﬁnition of Debt and Equity. Chapter 7 Expert Support—The Players and Their Roles. Chapter 8 Closing the Deal. Case Study 1 Asset-Based Lender, Receivables Financing. Case Study 2 Asset-Based Lender, High Risk Loan. Case Study 3 Asset-Based Lender, Assignment for Benefit of Creditors. Case Study 4 Asset-Based Lender, Acquisition. Case Study 5 Asset-Based Lender, Turnaround Funding. Case Study 6 Asset-Based Lender, Growth Financing. Case Study 7 Commercial Finance, Trade Financing. Case Study 8 Angel Investor, Initial Funding and Sale of Company. Case Study 9 Venture Capital, Early Stage Growth Equity. Case Study 10 Royalty Financing. Case Study 11 Venture Capital, Growth Equity. Case Study 12 Community Development Finance, Growth Funding. Case Study 13 Debt with Revenue Sharing. Case Study 14 Mezzanine Investment. Case Study 15 Private Equity, Acquisition through Exit. Case Study 16 Private Equity, Management Buyout / Partner Exit. Case Study 17 Private Equity, Restructuring. Case Study 18 Private Equity, Acquisition with Management Participation. Case Study 19 Private Equity, Public to Private Transaction. Case Study 20 Private Equity, Buy-and-Build Strategy. PART THREE Financing Source Directory. Suggested Use of the Directory Section. 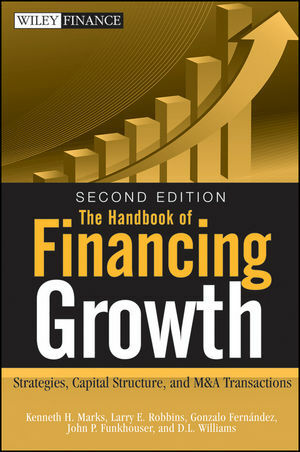 APPENDIX A Corporate Finance Primer. APPENDIX B : Financial Statements. APPENDIX D How Fast Can Your Company Afford to Grow? APPENDIX E Notes about Start-Ups. APPENDIX F Accounting Principles&mdash;GAAP and IFRS.